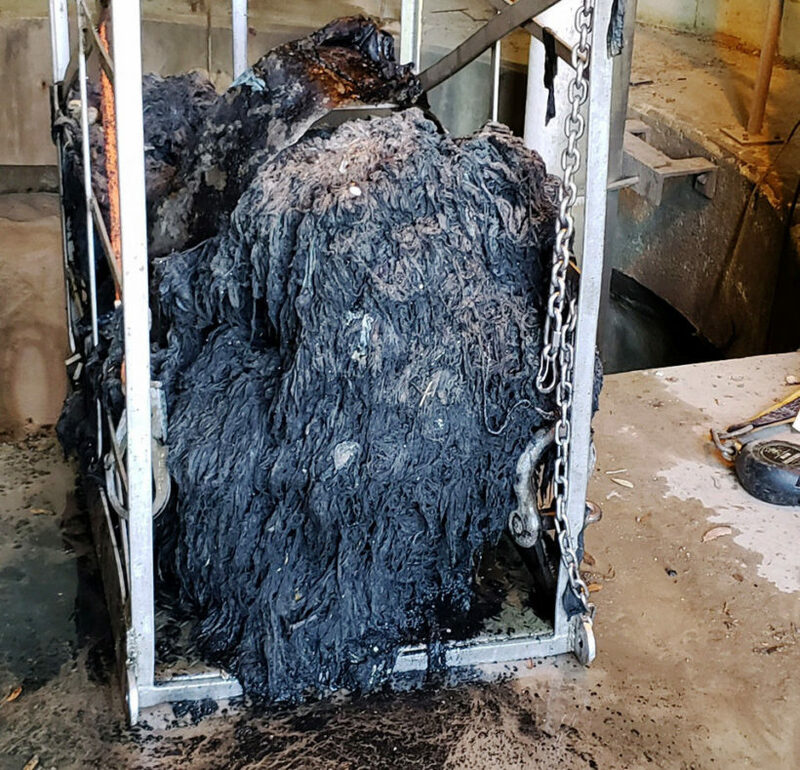 (Compiled from reports at WDSU, ABCNews4, Live5News, Post and Courier) – Baby wipes clogged a series of large pumps last week at the Plum Island Wastewater Treatment Plant in Charleston, South Carolina. Crews worked 24/7 to get those wipes out of the system. Three days later, the pumps were back to normal. WCIV reports thousands of pounds of baby wipes were collected. “…We sent divers 80-90 feet deep into the wet well/raw sewage to search in complete darkness with their hands to find and identify the obstruction. As we expected, they came up with these large masses of wipes in their first two loads, with more to come,” Charleston Water tweeted. “Don’t flush stuff like this. Joking of course, but you should only flush #1, #2, and toilet paper,” CWS officials said. Divers for the Charleston Water System found and removed large clumps of baby wipes clogging the pumps. Mike Saia, communication manager with Charleston Water System, told WCIV he hopes people take note. “It boils down to the fact that ‘flushable’ wipes simply are not flushable, they may degrade overtime and they may go down your toilet, but they certainly will block up the plumbing in your home, and wreak a lot of havoc in our system, so we would really appreciate any change that people could make,” he said. When pipes were backed up last Thursday, Charleston Water System hired three divers to collect thousands of pounds of baby wipes over a three-day span. The wipes are now set aside to dry out before being placed in a wasteland. Utility officials want people to throw wipes where they belong: in the trash headed to the landfill. Only nonwoven, biodegradable wipes break down in water, like toilet paper. Most commercial brands are woven, more like cloth than tissue. Clogs in homeowner plumbing as well as sewer lines have gotten so prevalent that at least one New York-based law firm, Robbins Geller, launched a class-action lawsuit against misleading claims from the “flushable” industry. Compiled from reports at WDSU, ABCNews4, Live5News, Post and Courier. When the Plum Island pumps clogged, four sewer mains backed up in four neighborhoods in Charleston. The problem, weirdly enough, stemmed from Hurricane Michael rains the Charleston area never got. Charleston Water System routinely brings down the flow in its sewer pipes to prepare for the onslaught of flood rain through the system. When the rain didn’t come, pumps moving the remaining flow apparently pulled along clots of disposables lining the bottom of the sewer pipes. “It blanketed the suction inlets at Plum Island,” Fairey said. About a ton of the stuff per day is pulled from Charleston Water System.